Believe it or not, part 1 was about the “perfect” people. Those who sense that homelessness will ever enter into their lives because they have everything set up just right. And as I mentioned, I have known quite a few homeless people who were brought up with that silver spoon and have become homeless. I have also known some really successful people who had confided that their child/grandchild is holding their life together by slender thread and the day the parent and benefactor passes on will be the start of a very uncertain future for that child/grandchild. I am mentioning this only to illustrate that every person can be touched by homelessness. It doesn’t just happen to losers. No matter how perfect you think your life is, it is basically a lie if you believe that you are perfect. I don’t think we can be perfect in this world. But we can make it better by helping others. I also have some ideas about the differences between the “good” and the “bad” people of this world. I was working in an office at a university a few years ago, and every so often one of the professors would come out and talk to me. He was deeply into self-flagellation and would bemoan his faults and mention his prozac use. Patiently I would listen and try not to add anything to his self-condemnation, but one day he was insistent. His fundamental question was “Don’t you agree that I am a bad person?” I looked up at him and told him that “There is enough bad in the good and good in the bad to make everyone pretty much equal.” I still believe that. Sure some people commit horrible crimes and I do believe that some people are just plain bad to the bone. But, that is a minority. Most people, as bad as they seem, will risk their life to save a friend, go out of their way to help someone from ending up on the downward path that they have found themselves on, or help someone who asks for their help. Other people spend time polishing their image, but underneath it all is a shallow person that would take the last dime from a widow or orphan. You never can tell on the surface, that is why I consider all people more or less equal and am an activist for changing the mind-set that people have about the homeless. But unfortunately, the people who believe that they are perfect and that everything they have is through their own efforts, are the hardest people to convince that homelessness can happen to anyone. But I will tell you that is can happen to anyone. I have seen people from all walks of life in homeless shelters and on the streets. A special education teacher who lived in a tent. PhD’s expounding about physics at the dinner table in the shelter. A former singer that traveled the world and is now wearing bright colors panhandling on the street. Women so innocent, you wonder: Why are you here in a shelter? Men so fragile, that you wonder how they can still live each day with such pain. When I first started writing this blog, I received a nice comment from a reader and decided to check out his blog. What I found was a person who started out as an activist for homeless people who had transformed into a homeless basher because of many frustrating experiences he had had in trying to reform the homeless. Let us get one thing straight: Some homeless people will not change despite your tireless efforts. Some people are “career homeless”. Does that mean that you give up on everyone who is homeless and let them all die through sickness and starvation. No. This is America, for Christ’s sake. We consider all people to be of equal value. All homeless people are worth some effort to help, but they must also realize that they can and should do things in order to help themselves. This is where drugs (and booze) play a big part in keeping homeless people from striving for help. These chemicals anesthetize the user against the pain of sleeping on the sidewalk, the jeers of passers-by, the sense of right and wrong that keeps someone from stealing/selling their body/etc. for another day of existence. People who use drugs have a much harder time getting off the streets, and usually do not do so until they are near death with their health irreparably broken. I have some friends that have chosen to be career homeless. I still accept them for who they are, although the thought of the last few hours of their lives is painful for me to think about. It most likely will be in some dark doorway on a cold night. They will be thinking of how everyone has abandoned them and how many chances they had to get help, but they threw those chances away because the offers were not “just right” for them. The homeless bashers would have you have you believe that any economic or social assistance to homeless people is a waste of taxpayer money. I say, try to lend a hand to someone, but use the tools that the government has to monitor how that help is being used (or misused). Don’t let them give their food stamp money to drug dealers (aren’t drug tests easy enough to do?) for example. Expect accountability. Expect some effort from the homeless person. The career homeless will scoff at being asked to do volunteer work in exchange for a hot meal, but those who really need the help, and appreciate it, won’t mind. 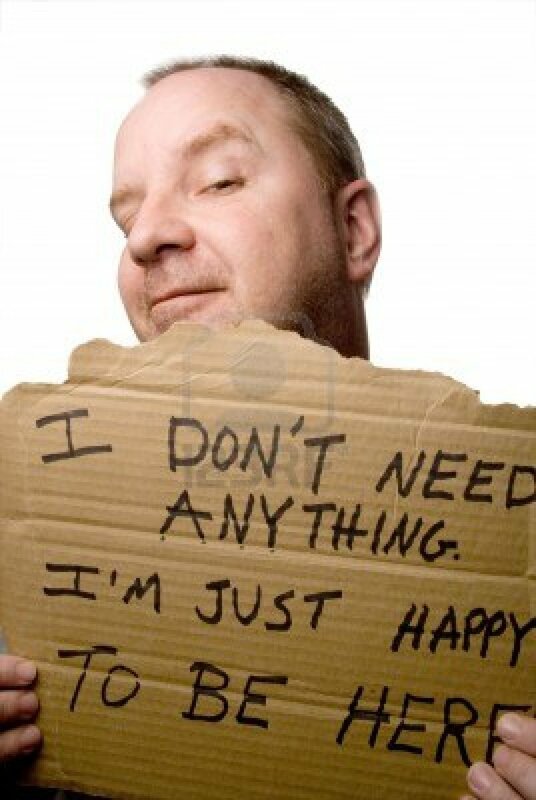 As a homeless helper, it is so easy to get into the trap of just giving, and not interacting, with the homeless. Overtime we see the scammers and overhear how they are bragging about the rip-offs they are perpetuating on the system. Then, slow by slow we become homeless bashers. Telling our friends what we observed and heard in the soup kitchen that we volunteer at, forgetting about the quiet person in the corner who was eating the meal and really needed your help and was grateful for it. When I was living in the shelter, I remember teens who were volunteering with their with various church groups and organizations, they would slip out cameras hidden in a bag or pocket and sneak pictures of various residents of the shelter. They had turned into homeless bashers, considering the shelter as their own private freakshow. They then went to their friends and family (or the internet) and used the pictures to ridicule those who were in the shelter. When we help others, it is good for our souls, as well as those we serve. But some people who are homeless helpers do not realize that the effort they put out to help someone has to be tempered with: (1) the knowledge that some homeless people can not be saved from their downward spiral, and (2)ALL homeless people need to be able to keep their self-respect by being an active participant in their effort to end their life on the streets. If we keep those thoughts in mind, then maybe we all will not end up as frustrated homeless bashers. I Have Just Read A Report On Homelessness In Our State. The report said that 46% of homeless people here are life long residents. So much for that “they are all from out of town” theory. Yet, not one of our elected officials will dare to bring up the subject of rent control. I love to reblog up-beat stories about how some homeless people are indeed nice people and how most still consider themselves part of the human race. — T.J.
A few days ago something very strange and magical happened. I started out the day feeling really high energy, really excited… about life, about creating, just generally jazzed. I was happily going about my day, when I had a dramatic shift in feeling. All that excitement just seemed to morph, to sink, into something completely different and not cool at all. Worry. Anxiety. Those “You’re not good enough”, “Why bother creating something that you’re not sure will be perfection” types of thoughts from my judgmental friend that sits in the back of my mind and occasionally elbows her way to the forefront. And so that is the spirit in which I try to engage our guests. Not coming with an arsenal of solutions, not really seeking a “cure” at all. But rather, trying to come as my most human, my most present, self. Coming close to listen. To cry with. To grieve and mourn loss. To celebrate victories. To share life. As a friend.” — Worth reading. T.J. This guest post is brought to you by Steffeny Feld, MSW. She did a year-long internship, and now works full-time, at a homeless resource center and shelter in Lebanon, PA called Lebanon HOPES (Helping Others by Providing Emergency Shelter). She brings joy and light and compassion to her work, but will be the first to tell you that it’s what she receives from the people she meets that is most profound to her. I recently watched a video by The Work of the People that really got me thinking about the nature of poverty. For most of us, the term “poverty” brings up images that relate to a deficit of physical needs. But poverty is far more than a lack of resources. Hey, great idea. Before serving the hot meal… help someone write a resume. (It is better to teach someone to fish then to just keep handing them fishes.) — T.J. The Millionair Club Charity put KeyBank to work the morning of May 22, 2013 when 12 volunteers reported for duty as part of Key’s 23rd Annual Neighbors Make the Difference Day. The KeyBank team met our program participants and provided job searching assistance – delivering resume tips, interview coaching and practice navigating online employment opportunities. We help rebuild lives by providing job opportunities—daily work assignments, temporary jobs and permanent employment—to Seattle-area men and women seeking employment. We also provide essential wrap-around services, including connections to housing, hot meals, showers, laundry services, eye care and preventive medical care to support our workers’ success and help address unemployment and homelessness in our region. He was taking a chance with that 100, but I give him credit. 🙂 T.J. So I sit down next to this homeless dude. I ask him about his night and his life. He shares the human struggle. As I get up to leave I have a hundred dollar bill in my pocket which in comparison to this guy means nothing to me. I hand it to him- he holds it a second and hands it back. “Man, thanks, really, but you gave me something way more valuable than that green paper”! Okay. I assume you read Part One and have a resume written out. Books at the library can help you with formatting the thing so it looks professional. Just don’t try to” lift” work references from the book. Your prospective employer will find out. This is the computer age, for God sakes. Now take that wonderful resume print-out and read it from an employers prospective. You have jobs here and there, in a couple different lines of work. Gosh! Your health care worker/office clerk/computer geek resume is a mish-mash of experience. Yet, Mr./Ms. Employer wants dedication. Commitment. What to do? You have to put your jack-of-all-trades cap on and retool your resume to focus on each individual industry that you are interested in. In you health care worker resume, put the spot light on what matters most for your prospective employer. Fill the page with volunteer work and show off your skill level. Do the same with your office clerk and computer geek resumes. Now, take the extra step and make 2 more hybrid resumes: health care experience with office clerk experience and office clerk worker with a computer geek bent. Hybrid resumes are great when you are transitioning from one career to another. You will have plenty of extra space on the focused resumes to put in all the tiny details that would set you apart from the pack. Think long and hard about these details. Gather all those “pat on the back” moments and breathe some life back into them. Add in what you know past employers have valued in you and don’t be modest about accomplishments, especially if you can throw in a numerical value (sales up 25%, increased inventory production by $3,000 a month, losses decreased 30%, etc). In the references section, drop in “References available upon request” and, if you don’t have them yet, get some. They come from everyday places… church members, people who are helping you in your employment search, educators from classes that you have taken. Just be sure they have a clear speaking voice, can say something good about you and your character, will be clean and sober during business hours, etc. Once you have your resumes ready, it is time to think about cover letters (will it never end!??! you ask.) Just use the same cut and paste formula like the resume, focusing on each employment skill. Oh, and this is where it gets easy. Those books in the library with cover letter formats (the real syrupy sounding kiss-up letters), you can actually copy whole paragraphs and count them as your own. Just make sure that what you copy applies to you. Plus, you can talk about something that is already in your resume (just re-word the baby, don’t want them to think you cut and pasted from the resume). Take your cues from the job postings ad and write a cover letter emphasising that you have the experience and skills that they need. Ta-da. Now you have a wonderful introduction package to present, either on-line or through snail mail, to your prospective employer. What’s next? Getting ready for the dreaded interview! If you are prepared ahead of time and you really like (and are interested in) the jobs you have applied for, then the interview will not be so bad… I promise. See interview tips in Part Three. I just wanted to post a few tips that I have learned over the years and some that I picked up from reading Career Cowards Guide to Resumes by Katy Piotrowski. You can handle this situation two ways: A) Use a friend’s or relative’s street address on your applications, until you get settled. Or B) Look below the street address line, there sometimes is a mailing address line. Use this for your P.O. Box address. Tell them that your mail delivery person is near retirement and keeps miss-throwing your mail, or that the mail thieves in the neighborhood are making off with your important mail (use this if you don’t care that they know you live in a high-crime area, or hell, you might drum up sympathy). Granted some lazy or mean administrative assistant may “out” you by using the first address on the application (Been there!). But since you already warned them that your mail situation is dodgy, just breezily state the tiresome reasons for using the second address and leave it at that. To find out more, they would have to go to the street address themselves and check if you really live there. Most people don’t want to go to that trouble. When you are writing a resume, a little chutzpa goes a long way. View yourself as a “big ticket item” and sell yourself. Think about all your glorious working moments and all those unsung praises and proudly include them on your resume. Being shy and modest here will make your resume appear as if it was written in invisible ink. Think about all your greatest qualities, accomplishments, and moments of glory and sing your own praises. 1) Write out an experiences inventory. Remember every job, no matter how small or when you worked for no pay, just to help a friend out. What were you good at? What got you attention? 2) Figure out your career target. That’s the job you want, and bump it up one level. Worked in sales and did most of the managers job as well? Aim for that job. 3) Pin point your key skills areas. It might help to find a job description of the job you want and copy those skills that apply to you. Use these skills in powerful sentences using active verbs. Experienced in… Skilled at… Increased sales volume… you get it. Of course, you will be asked about the three different employers in the interview, but if you have a reasonable explanation of why you moved jobs, at least you get to tell them about it. How to explain gaps in Employment. Okay, the Monster Recession got you, but you still have to explain why you were out of work on your resume. One of the goodies that I learned from the book was: You can list self-study and even volunteer work to fill the gaps in your employment time line. What is self-study? If you checked out library material and learned e-publishing, HTML, flower arranging, negotiation skills, etc. write it down as self-study. It would help if the area you studied pertained to a job skill and you know enough about it to wow Mr./Ms. HR should they ask you about it in the interview. You have the experience, but didn’t hold the job title. Another good idea. List job as a function (ie: “Worked in engineering” instead of “worked as engineer”). Here are some more tiny tips: Get a good email address. It can be free (like gmail), HR people look down on Yahoo email, esp. those with funky handles (sweetnspicy@yahoo.com is not professional). Go for an address with your given name and maybe your city separated by a period (judyeverts.seattle@gmail.com), so you don’t get a lot of numbers after your name. Think about every question that someone could ask using information on your resume and have a stellar explanation ready for them. Be prepared. Now that you have your professional looking resume in hand, the next step is to customize your resume to every employer that you send it to. Yes, they do expect that. We will review some quick and easy tips for this in Part Two. Read a post about Career Counseling for the Homeless here. While last year’s Point in Time survey of Dauphin County’s homeless population did not take into account exact ages, females made up the majority of the population. In 2012, 58.9% (159) of Dauphin County’s homeless population were females, and 41.1% (111) were males. Also, there were 127 homeless children counted in the 2012 Point in Time census. According to our Point in Time survey last year, 19.6% (55) of the area’s homeless population were employed. There are many resources available to help these individuals find jobs, but finding a job with limited resources, such as lack of home or transportation, makes the process more difficult. 3. People are homeless by choice.